Today myself and hundreds of other workers in the food and hospitality sector are walking out on strike. This action sees trade unions – among them Labour affiliates Unite and the Bakers’ Union – working together in an unprecedented way. This is the first time co-ordinated industrial action in this sector has taken place in this way, and the first strike where both in-house restaurant and delivery workers are joining forces. I have worked as a waitress for eight years, and frankly I have seen it all. At TGI Fridays, this dispute started when our bosses decided to ‘reallocate’ 40% of front-of-house staff card tips to the kitchen teams. In reality, this was a move to plug the gap of the low wage they pay us all. This has resulted in a loss of earnings of £200 a month for some of my colleagues, many of whom have families to support. This is all while the chief executive of the company has pocketed a gross £100,000 pay rise. Our fight isn’t just about tips, though. Just like our McDonalds, Wetherspoons, Deliveroo and UberEats comrades, we are fighting for a real living wage and an end to unfair age rates of pay. No single person’s daily labour should be worth less than another’s. Guaranteed hours and union recognition are next on our list of demands. We need to be able to negotiate collectively for better working conditions, pay and benefits, and we need to be able to submit grievances collectively. Individually we are weak, easily picked off one by one by unscrupulous employers; but together we are strong and we will be heard. I am proud to be on strike today. Workers from across the industry, from different workplaces and different unions, are proving that we won’t allow those differences to divide us. We are proving that young, precarious, low-paid workers are not apathetic or grateful for a job. We are angry and we’ve had enough. We won’t stop until these companies agree to meet with us and work on a resolution, or until laws are changed to better protect employees. We need to remember our worth and fight for what we deserve. I strongly encourage every waiter, bartender, delivery driver, chef and cleaner to take a stand and join a union. Every worker struggling on minimum wage or zero-hour contracts has a place and a voice in our movement. We cannot be ignored forever. The announcement from Conservative Party conference this week was an opportunist carrot thrown our way. 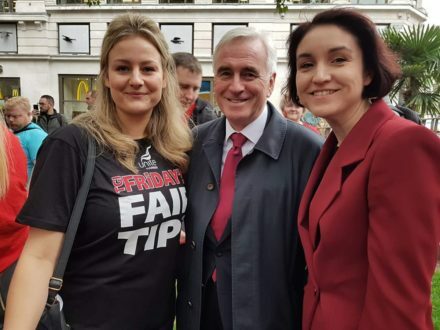 If real action will be taken on employers stealing tips, great – and make no mistake, it was our industrial action that got the goods. But if we want to win a real living wage for all workers, we must step up the fight. And if we can win major concessions from multi-billion dollar corporations from a mobilised labour movement, we legitimise the demands of a future Labour government. So show your support today – in person or online – and help us serve up some fast food justice. A list of all pickets and solidarity actions taking place today can be found here and you can tweet support using the #FFS410 hashtag. Lauren Townsend works at TGI Fridays.